If you are looking at doing a fairly major building / construction project / alteration, having this product may halve the project time taken to complete the job - no downtime for bad weather that would usually hold up the project. 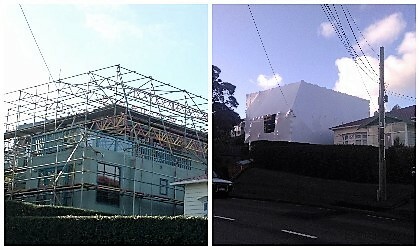 Cougar Scaffolding specialise in providing scaffold and temporary roofing structures for shrink wrap, weather containment in the greater Wellington region. We have had great feedback from customers who have used this service. It is becoming an increasingly popular option when building, recladding, re-roofing a home or any building job that needs to keep the weather out and workers working, enabling you to get into your building faster. 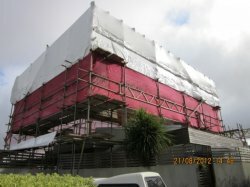 Cougar Scaffolding will work in conjunction with the shrinkwrap provider, the builder and the owner to ensure requirements are met for the best, safest and most efficient results.